The Big Brothers Big Sisters Mission is to provide children facing adversity with strong and enduring, professionally-supported one-to-one relationships that change their lives for the better, forever. 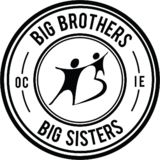 The Big Brothers Big Sisters Vision is successful mentoring relationships for all children who need and want them, contributing to brighter futures, better schools, and stronger communities for all. facebook join 700+ others and like Givsum. Made with passion in Orange County, CA | © 2019 Givsum, Inc. All rights reserved.